The software is very easy to use and is specially dedicated to the MINIFOR fermenter. All the connection cables and adapters are included in the package. Connection from one to six fermenters. Local (you can change set points on the fermenter) and remote (you can change set points only on the program) mode. All the actual values and setpoints (temperature, pH, air flow rate, pO2, agitation, X for supplementary channel) are displayed on the screen.Their values can also be displayed on trends. 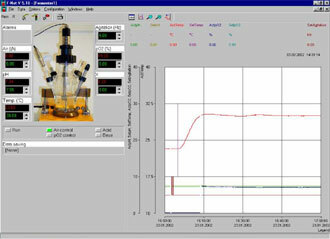 The user can then follow on line the evolution of every fermentation parameter. All the setpoints can be changed from the PC. The alarms can be changed from the PC and are then stored in the fermenter. The actual values and setpoints values can be saved in a text file at a defined time interval. The file format is compatible with the most program used for statistical treatment or report production on the market. A profile can be defined for every setpoint. The software gives you then the possibilty to be sure that the conditions you wanted has really happened (you can compare the setpoints and actual values on the trends). You can also compare the data files for fermentations made in different conditions to optimise your process. For more complex control strategies we have developped the software Siam.